With all of the wedding anticipation over the last few months and then all of the fun a couple weeks ago Miss E was wondering about my wedding dress. We've been talking about pulling it out and were able to have some special time on Monday looking at a bunch of my wedding stuff. 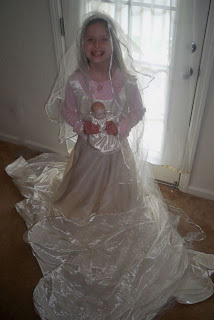 She was so cute putting my dress, shoes, and veil on and then we looked at wedding pictures. After that we started pulling out some of the baby books and other baby things I keep in the chest. It was such a sweet special time with her!